What color is that yarn? I love it and can't find it! The color is Minty, I just looked over on the Red Heart website and it looks like it is available there. The only place I can find it locally is at my Walmart. I love the scarf. Starting to make it now.Did you starch or block it when done? Thanks Linda! No, I did not block or starch it. Would you consider a video tutorial? Thanks for the request, I am hoping to get to some video tutorials soon and I will add this one to the list. I would like to know how many chains would I need to make this scarf narrower ? I can't seem to get my comment to be delivered so maybe this time it'll work. Sorry for this. Hi Maxine, If you would like the scarf to be thinner you can work less rows. 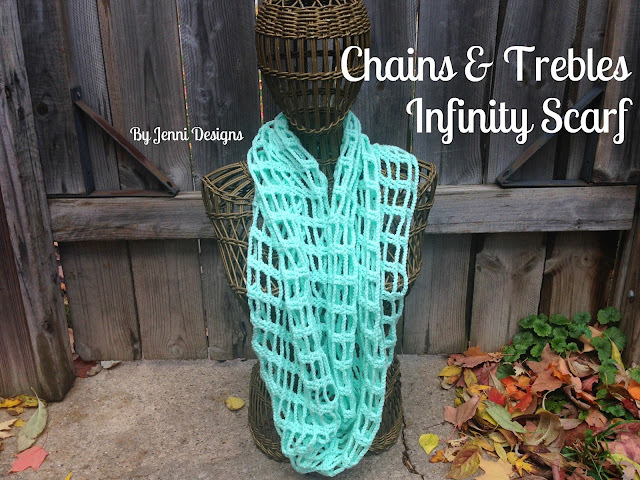 If you start with fewer chains the scarf won't be able to wrap around your neck twice. What is the length, I didn't see it listed on the parrern? Hi Yvonne, I'm sorry I didn't record the length since it's an infinity scarf. You can easily figure the length by measuring the beginning chain. Would you be okay with people selling the scarves after they use this pattern? Would you be okay with people selling the scarves after they make them? Hi Lindsey, I'm so sorry I am just now getting back to you! 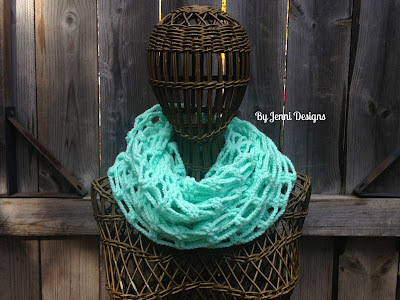 I am better reached on fb or ig ;) but.....Yes, you may sell anything you make from any of my patterns! Thanks for asking, I appreciate it! I’m not sure if I am doing something wrong or not. When I get to the end of the first row, I have 4 treble crochets all together. I’ve done it twice and get the same thing. Is this correct or am I missing something?